Garnish: olive oil, zaatar spice, fresh herbs like parsley, toasted pita bread. Make a foil packet with wood chips for smoking. Wrap ⅓ -½ cup of wood chips in heavy duty foil and pierce the top so smoke can escape. Place this on the grill. See photos. With a sharp pairing knife cut 1-2 inch deep slits into the eggplant, all over especially around the bigger bottom area. This will allow them to cook more evenly, and help smoke penetrate. When the foil packet is smoking, place the eggplant directly on the grill, and close the grill. Turn eggplant every 10 minutes or so and let the skin char. Cook until eggplant has collapsed and feels tender on the inside. Place the eggplant along with the smoking foil packet in a large bowl or large pan and cover tightly with foil. Let sit until cool enough to handle about 20- 30 minutes. Place the drained eggplant in a mixing bowl. You should have 2 cups (or 2 1/4 cups) of eggplant flesh. If you have less, see notes. Add the tahini paste , garlic, lemon, salt, yogurt and 1 tablespoon of the smoky liquid reserved from the bowl. Mix, taste, adjust salt and lemon. For a delicious richness, add 2-3 tablespoons plain yogurt ( optional). Stir with a fork until relatively smooth. Place in a shallow serving bowl, make a circular well with the back of a spoon and drizzle with olive oil, and sprinkle with your choice of aleppo chili flakes, zaatar spice, or sumac. Sprinkle with fresh herbs. 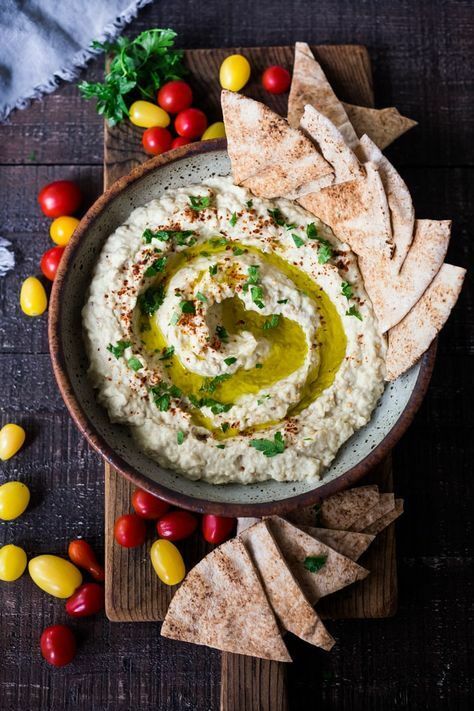 Serve with warm pita bread and/or veggies. 0 Response to "Authentic Baba Ganoush"